The plant breeding behind the green revolution has delivered amazing results, way more than two ears of corn where one would grow before. Those gains, however, depend on tailoring the environment in which the seeds are planted to suit those modern varieties. If a farmer can’t afford to do that, or isn’t willing to use the herbicides and fertilisers modern varieties require, they’re kind of stuck. The market isn’t really interested in providing the kinds of varieties you need. Before the explosion of scientific breeding, however, farmers did their own plant breeding, by selecting the best plants and saving their seeds to sow the following year. The plants were genetically diverse, so there were always some that would do better and others that would do worse. Modern varieties are entirely uniform, so if conditions aren’t perfect, the whole field does poorly. While some farmers are rediscovering the benefits of the old varieties created in just such a way, a few are looking to create the future. They won’t adapt the environment to suit their crop; instead, they’re adapting the crop to suit their environment. The process is based on hugely diverse evolutionary populations of wheat, and it is giving the farmers wheat that performs better now and that will be able to track whatever climate change brings. 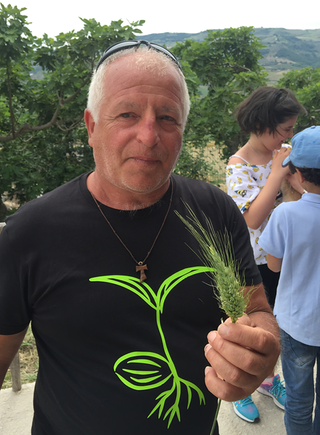 Italy has been suffering a drought this year, but the farmers who are working with these evolutionary populations are much less bothered by it than those who depend on modern wheats. The work with evolutionary populations is part of an experiment organized by Rete Semi Rurale, to help farmers get the kinds of varieties they need, an important part of which is to show local farmers what the experiment is about. I joined them on one such open day in the southern Italian region of Molise. Matteo Petitti is sharing the results of the research at his website. Matteo Petitti mentioned this note on twitter.com. Arpita Bhattacharjya liked this note on twitter.com. Jeremy Cherfas mentioned this note on stream.jeremycherfas.net. AgroBioDiverse mentioned this note on twitter.com. Wheat growers are making use of hugely diverse evolutionary populations to give them the seeds they need.